FORTUNE -- They may not rank with "I'm from the government, and I'm here to help you," or "The check is in the mail," or "I'll respect you in the morning," but promises over the years from Lexus that it will make its mechanically impeccable vehicles more daring and emotional in their design are beginning to have an empty ring about them. Just-auto.com April 13, 2004. "Expect more boldly styled cars from Lexus, Lexus group vice president and general manager Dennis Clements told Reuters. "'Our customers have told us they're looking for a more emotional and elegant design.'" AsiaOne Marketing," Nov. 28, 2007: "Lexus shifts into higher gear with play on emotions. More Lexus high-performance sports models can be expected in the near future and it will be more than just that the Japanese luxury carmaker wants to make faster cars -- the goal is to inject more emotion into the marque." The Motor Report, July 23, 2011 "Lexus promises a more defined and emotional design philosophy for the new sedan's styling. 'Our customers have been waiting for a new GS that's more intense in every way,' Lexus boss Mark Templin said." See a pattern here? Lexus has been promising to do something about its unimaginative design but has been unable to live up to its own standards or the demands of conquest customers. U.S. boss Templin came to New York to talk up Lexus last week, and if he felt uncomfortable about the shortcomings of its emotional intelligence, he didn't show it. Like his predecessors in the Lexus job, however, he must be frustrated by the brand's inability to establish itself solidly in the top rank of global luxury brands because of something so intangible. At 22 years old, Toyota's (TM) high-end division is the youngest of the upscale brands. (Mercedes-Benz, 125 this year, is the oldest.) While it has equaled or surpassed its competitors in customer service, quality, and reliability, Lexus has never achieved that iconic status that comes from a mystical combination of style, heritage, and driving dynamics. That shortcoming becomes especially apparent when Lexus suffers a drought of new models, such as it has this year. Through October, it has been looking at a steep 17% decline in sales in an otherwise strong luxury market. By comparison, Mercedes sales have climbed 10% this year, BMW 12%, and fast-rising Audi 15%. In contrast to previous years, Lexus is taking some concrete steps to address its emotional shortcomings, although it is unclear how much they will contribute. 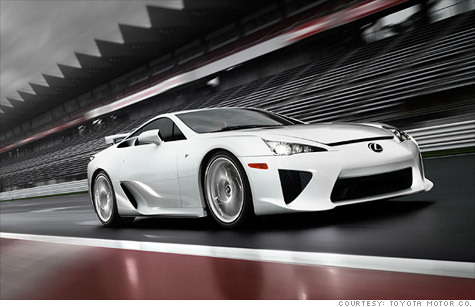 In October, for instance, it began accepting orders for a Lexus supercar, the LFA. Its specifications are jaw dropping: Powered by a 10-cylinder engine, the hand-built carbon-fiber two-seater is capable of a top speed of 202 miles per hour. The price is equally jaw dropping: 37.5 million yen or $350,000. The LFA is the living definition of the halo car. With no rational business case attached to it, it exists entirely as an expense item in a marketing plan, designed to suffuse the rest of the Lexus lineup in a favorable glow and thereby change perceptions about it. But supercars have become as common as subvented leases in promoting luxury brands and tend to have short sell-by dates. They command public attention only until the next supercar comes along. The Nissan GT-R, nicknamed "Godzilla," was the talk of the industry when it came out in 2007, but more lately has been filed under the heading of "yesterday's news." Besides, the LFA seems weirdly out of phase with the rest of Lexus's lineup, since Lexus prides itself on having more hybrids than any other luxury car brand. Lexus calls the LFA a test bed for new technology, but it is hard to see 12-cylinder engines or carbon-fiber bodies finding their way into the model range. The LFA stands as kind of a rebuke to the typical Lexus owner: She drives an RX crossover, the most popular Lexus, and the one model that contributes 40% of Lexus sales. If Desperate Housewives had a show car, it would be the RX, popular in upscale suburbs from Scarsdale to Santa Monica. But it is hard to imagine one of its owners getting behind the wheel of an LFA unless her name is Danica Patrick. The LFA aside, Lexus is poised to experience a spurt in sales as it launches a flurry of redesigned models, beginning with the GS sport sedan. That's a positive. It also has an edge in fuel economy. Thanks to the presence of five hybrids in its lineup, it doesn't face the same pressure as its competitors to downsize its models to meet fuel economy standards. Templin says Lexus will be offering no cars smaller than ones it already sells. But more emotional Lexus cars? We'll have to see. You never hear Mercedes or BMW talking about their emotional design. It's part of their genetic code. Lexus may just have to focus on what it does best -- quality, reliability, customer service -- and hope that its strong connection with its customers comes along that way.